Spending the four seasons traveling and living out of an RV takes considerably more planning and commitment than packing up for the weekend and heading to the nearest campground. Camping and road tripping around the country all year long may seem like a distant fantasy, but with the right preparation, it’s entirely possible to turn it into reality. Here are our best tips for staying on the road through all four seasons. Committing to a year of RV travel comes with leaving some creature comforts of home behind, but the rewards of a lifestyle filled with adventure, relaxation, and exploration. Here are a few things to consider before setting out. What to do with your home? If you rent, consider subletting your house or apartment while you’ll be gone or withdraw from the lease entirely. Homeowners have the option to sell or turn their property into a rental—which comes with the bonus of monthly income but the burden of potential landlord duties while traveling (unless you hire a company to manage it all for you). And what about all the stuff? After packing everything to bring along for the journey, year-round RVers usually sell their remaining belongings or put them into a storage unit for safe keeping. To work or not to work? This decision is primarily based on an individual’s financial situation and can be a tough one holding many people back from long-term travel. Retirees are usually off the hook, while those who still require an income can find financial security through remote work, short-term and seasonal gigs, or investment earnings. Is your RV ready for year-round travel? Having a reliable RV in tip-top mechanical shape for plenty of miles and potentially freezing temperatures runs high on the list of necessities. Putting in the time and effort to prepare the vehicle beforehand—and brushing up on your RV mechanical knowledge—leads to fewer headaches once you hit the road. Is it possible to receive mail? The short answer: yes. One of the most useful tools for people transitioning to calling their RVs home is a mail forwarding service. These companies typically charge an annual fee in exchange for a secure mailbox that you can have your mail sent to and then forwarded to your current location. Camping in an RV year round can be a game of chasing good weather with each season. When spending so much time outdoors, most travelers try to avoid extreme heat, cold, and storms, though all are inevitable at some point no matter how well you plan. At the same time, living in a mobile unit spells opportunity for perennial spring-chasers: You can pick up and leave as soon as the weather starts to turn. Choosing a place to stay for the night, week, or month (hey, why not?) is a constant to-do when RVing, and the changing seasons add another layer to the planning. Making reservations during prime camping season, which can be spring, summer and/or fall depending on the destination, can save you the disappointment of pulling up to a full campground. Come October, many KOAs in cold-weather locations close their doors for the season, though hundreds of KOAs in temperate areas across the U.S. remain open all year. 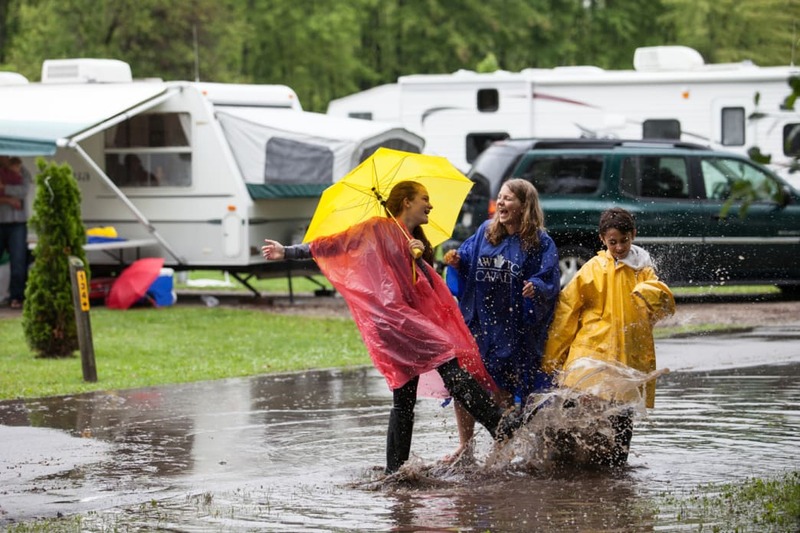 When it comes to comfort in variable weather, not all campgrounds are made equal. Staying in places with a full list of amenities like indoor lounges and heated laundry rooms becomes even more appealing in winter, while swimming pools and beach access may top the list in summer. Access to water pumps right in the convenience of camp becomes crucial in winter, as many public spigots, including those in state and national parks, shut off for the season. High and low tourism seasons vary widely by region and specific destinations. In general, spring and fall mean busy season for the Southwest; summer marks prime beach time on both coasts and comfortable climates in the northern Midwest, Pacific Northwest, and Canada. Winter attracts skiers in the mountains in the West and Northeast, as well as holiday crowds in big cities. Sometimes going with the crowds is inevitable to chase ideal weather and special events, though going against the grain certainly has its perks. Know where to find open campgrounds: Not surprisingly, the open campgrounds mirror the regions with comfortable winter camping climates. 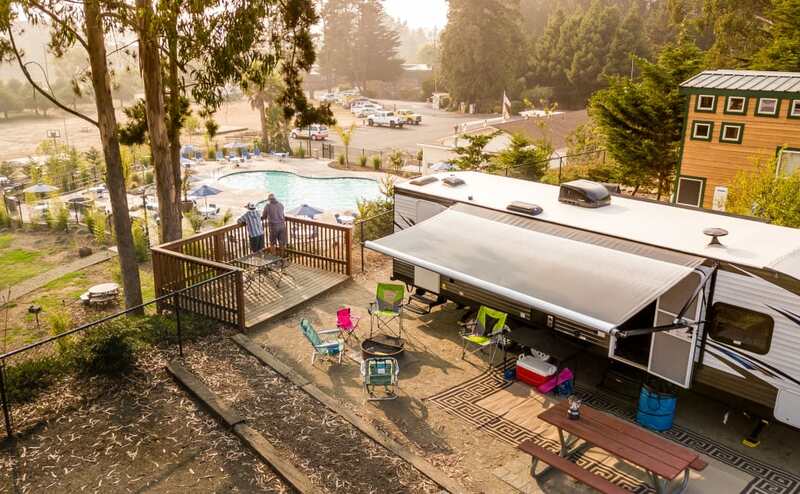 Browsing the list of KOA campgrounds to check their closure dates or find the year-round locations makes planning a breeze. Think about the roads: Consider road conditions in between locations just as much as you think about the weather in your destinations. Mountain passes or other high-altitude roads can be dangerous or closed during storms (or for the entirety of snow season). Work the off-season like a pro: Try to take advantage of popular tourist destinations that are accessible during the off-season, like the Grand Canyon, the California coast, and the Florida coast. Even if the weather may not be absolutely ideal, the smaller crowds tend to make up for it. Leaving your house behind and traveling full-time for a year isn’t for everyone. But there’s no better way to see the country and experience the trip of a lifetime. Written by Jenna Herzog for RootsRated Media in partnership with Kampgrounds of America.